Dog Who Spent His Entire Life In Chains Visits The Ocean For The First Time – Animal Lovers Unite! Herschel spent the first five years of his life chained in a lonely backyard. His teeth were worn down from attempting to chew himself free. After his rescue, the gorgeous German Shepherd was adopted twice, but returned both times. It seems his heartbreaking start to life left behind some emotional damage. Luckily, things were about to turn around for Herschel in a big way! Rocky Kanaka, passionate dog rescuer and creator of the Dogs Day Out web series, took an interest in Herschel (whom he affectionately refers to as Bear). He featured him in a viral video showing the dog seeing snow for the first time and giving out free “Bear” hugs. The exposure worked, and soon Herschel was on his way to Washington to live with his new forever mom! Kanaka wanted to share one more moment of firsts with his cuddly pal, so he planned a special detour to the beach on their way to Washington. At first, Herschel gazes dreamily at the crashing waves. As his excitement builds, he begins to whine, and then cry out with elation. Get the tissues ready, this video is a tearjerker – in the best possible way! After moving in with his new family, which includes two other German Shepherds and several acres to run on, Herschel’s mom shared several updates on Instagram. It turns out the burly pooch prefers the name Bear and has decided to go by it full-time. He also decided that five years of isolation was more than enough. Bear now spends his time snuggling with his human and canine family members every chance he gets! Such a happy ending for a sweet, deserving dog! Follow Dog’s Day Out on Facebook and YouTube for more heartwarming videos! 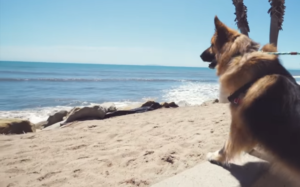 The post Dog Who Spent His Entire Life In Chains Visits The Ocean For The First Time appeared first on iHeartDogs.com.